Give folks easy ideas to get their veggies in at breakfast (and help them to meet their quota for the day). That was one of the key messages I share at this year’s Canadian Produce Marketing Association Conference in Toronto where I was showcasing quick and easy veggie-centric meal ideas to 100+ dietitians. Eggs and veggies go great together and because this Broccoli and Cheddar Muffin Tin Frittata (recipe below) is hand held and make-ahead, it’s easy to say yes too. Hot or cold, it’s great for lunches too. If you happen to have some extra broccoli leftover, you’ll find some new ways to use it here in this video, Broccoli 4 Ways. Dietitian's Tip: Did you know? Eating cruciferous vegetables like broccoli may help to reduce the risk for 5 types of cancer as well as heart disease. Food really is medicine and eating well is an investment in our good health. In a medium size skillet, heat 1 tbsp canola oil over medium-high heat, add 1 onion, chopped, 2 cups of small broccoli florets and ¼ tsp EACH salt and pepper. Cook until onion and broccoli are softened, about 6 minutes. In bowl, whisk together 12 eggs and ¼ cup of milk. Add softened broccoli and onions to egg mixture. Divide egg mixture into 12 greased muffin tins. Divide 1 cup shredded cheddar cheese over each egg muffin. Bake in 375°F oven until the edges are set and cheese is melted, about 25 minutes. Broil, if you wish, until puffed and golden brown, about 2 minutes. • To avoid soggy frittatas, don’t rush cooking the vegetables. Give them the 6 minutes to cook down. • Remember to grease your muffin tin well unless your idea of fun is scraping baked egg. • Cut up square pieces of parchment paper work as great muffin tin liners. 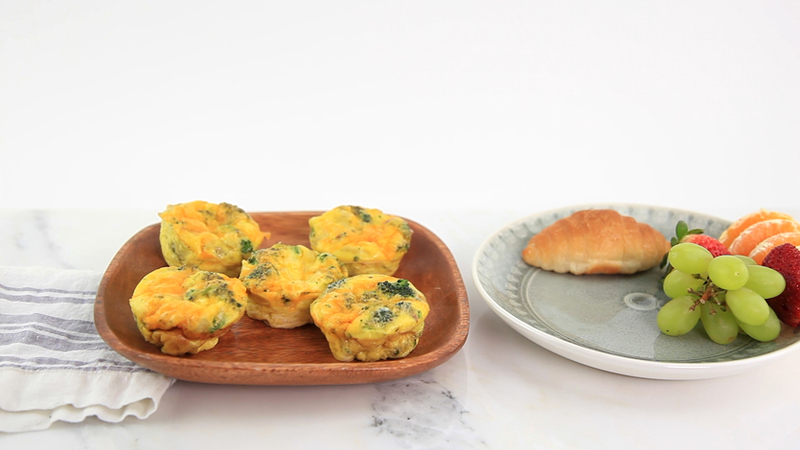 • These mini frittatas freeze well for up to a month and are perfect for a grab-and-go breakfast or even a snack. Simply cook and cool completely before freezing. Reheat in the microwave 30 to 40 seconds to heat through. Be thrifty like your grandmother! • Broccoli stems are edible and nutritious. The stalks have just as much vitamin C as the florets. Trim, peel and dice them.